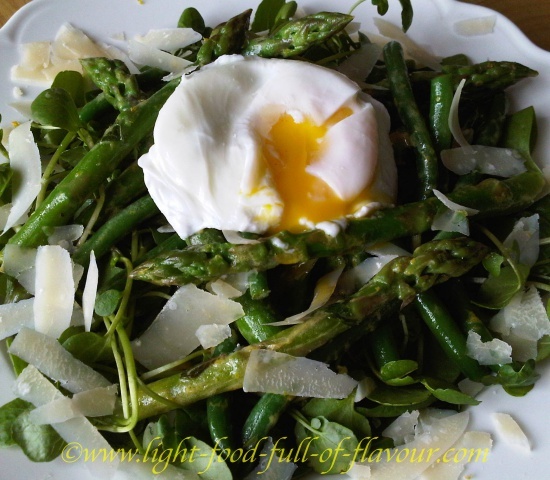 As it is the season for asparagus right now, I’m adding a recipe of mine for a delicious asparagus salad with green beans and poached eggs. Asparagus is a nutritional powerhouse. It is a good source of vitamin C (particularly green asparagus), folic acid and potassium. It is also high in antioxidants, packed with fibre and protein and contains anti-cancer properties. 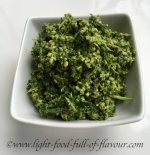 Green beans are rich in silica - silica is important for keeping bones strong – and also contain folic acid and vitamin C.
I use watercress and baby spinach in most of my salads. Both are incredibly nutritious, and in my view also very tasty (see Nutritional Information). It is easy to think that all types of lettuce leaves are really nutritious, but this is not the case. Iceberg lettuce contains 96% water and ranks the lowest in nutritional value (it is nearly devoid of all nutrition). The darker the lettuce leaf is, the more nutrition it has – romaine and red leaf lettuce are good choices, followed by rocket (arugula). I do recommend adding spinach to your salads, and watercress if it is available (which it is in Britain). I top this asparagus salad with poached eggs to make it more of a meal – and I and my big appetite will have two eggs, thank you very much! I eat it with sourdough bread topped with avocado and red pepper (bell pepper), or sourdough bread with tomatoes and garlic. And eaten like this, it becomes a light, mega-healthy and utterly tasty meal! You can use nothing but olive oil for the dressing - 3 tablespoons - if you don't have any flax or hemp oil. 1. Put a pan with some salted water on to boil for the asparagus and beans, and another one - without the salt - for the eggs. Make the dressing by placing the mustard, pinch of salt and pepper and the vinegar in a bowl. Whisk the ingredients together and keep on whisking while slowly adding the hemp or flax oil and olive oil. Add the water and whisk again. 2. For the asparagus salad, place the asparagus and beans in the pan with simmering salted water and simmer for 4-5 minutes (depending on how al-dente you like your vegetables). Drain in a sieve. 3. While the vegetables are cooking, poach or boil the eggs. Divide the spinach and whatever other leaves you are using between 4 plates. Scatter some shredded mint leaves over each plate. Divide the asparagus and beans between the plates and top with poached or boiled, peeled and halved eggs. 4. Add the lemon zest to the mustard dressing and sprinkle some dressing over each plate, followed by either Parmesan shavings or crumbled feta cheese.